It's four days into September and I don't even recognize myself. I've taken a slippery slope and strapped myself in for a ride. That slope's name is pumpkin spice. I'm not really sure how it happened. I'm normally anti-pumpkin until at least October. I like to give apple a chance to make its way into my baked goods so that I can ease into cinnamon and say goodbye to summer before ginger and clove bust in, commandeer all the flavor profiles in the name of chilly weather. Don't get me wrong, I love me some pumpkin. I will never pass on a whipped cream-studded pumpkin pie slice or a crumbly-topped pumpkin muffin. It's because I like pumpkin so much that I liked to keep it special. I like the buildup of fall in the weeks when the weather can't seem to commit to a chill and orange and yellow leaves are merely a freckle amidst the green. I once read a study that people enjoy the anticipation and preparation for a vacation more than the trip itself. This is almost true for fall and me. I love waiting for that moment when fall will suddenly arrive overnight, greeting me in the morning with visible breath, a chill on my cheeks and the bright pop of red against a perfectly cloudless blue sky. I guess you could call me impatient this year. I walked into the baking aisle and robotically gravitated toward the cans of pumpkin with arms outstretched, not realizing what month it was or what silly self-imposed rules I was breaking. Something inside me couldn't wait for the autumnal air before I turned on my oven and sent the scent of cinnamon and pumpkin wafting through my apartment. oh look! I made you a video... because I'm obsessed with the Hyperlapse app. 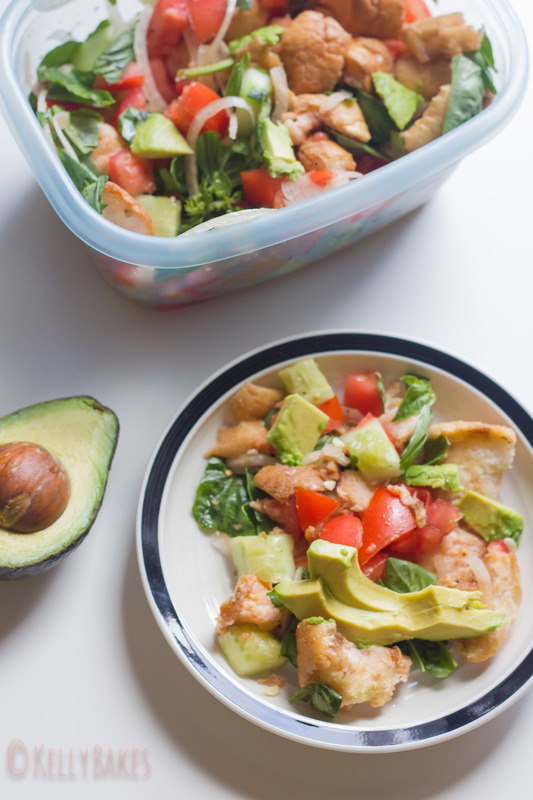 Be sure to check out all the tasty treats for Leftovers Club this month and feel free to check out more information about how to participate if you love to make treats and get them in the mail! In a medium bowl, sift together the flour, salt, baking powder, baking soda, cinnamon, ginger and cloves. In a large bowl, whisk together the brown sugar and vegetable oil. Add the pumpkin and stir until well combined. Add in the sifted flour mixture and stir until just combined. It should be a thick batter. Using a small cookie scoop, scoop rounded balls of batter onto a parchment-lined cookie sheet, leaving at least 1.5" between each ball. Bake 12-14 minutes or until a toothpick comes out clean. Remove the whoopie pie shells from the tray with a metal spatula and allow to cool on a cooling rack while you prepare the marshmallow filling. To make the marshmallow filling, add 1/4 cup cold water to the bowl of a stand mixer fitted with the whisk attachment and sprinkle the gelatin on top. Allow to bloom for five minutes. In a medium saucepan, combine the corn syrup, remaining 1/4 cup water and sugar. Stir to make sure all the sugar is moistened, then attach a candy thermometer to the side of the pan and cook over medium-low heat until the temperature reaches 240F (soft-ball stage). Remove the pan from the heat immediately. Turn on the stand mixer and slowly drizzle the hot sugar mixture into the bloomed gelatin. Whisk on low for 2 minutes. Increase the speed to medium and whisk for 3-4 minutes then turn the speed up to high and whisk until the mixture has become white, glossy and tripled in volume. Turn off the mixer and add both the bourbon and vanilla. Turn on the mixer and whisk for an additional 15-20 seconds or until the flavoring is incorporated. Allow the marshmallow mixture to sit for 5-7 minutes and start to firm up before adding it to a piping bag (If the mixture is too runny, the marshmallow will seep out of the whoopie pies and onto your counter and everything else in your kitchen, making a big ol mess! To tell if it's firm enough, spoon a bit onto a whoopie pie shell. Top with another shell. If the marshmallow runs over the side, it's too runny. If it stays in place, it's good to go!). Once the marshmallow is slightly more stable, add 1/3 of the marshmallow to a piping bag and pipe a quarter-size amount of marshmallow onto a whoopie pie shell. Sandwich with another pie shell. Allow to fully set (at least 4 hours) before eating. You can learn a lot from someone by looking at their cookbooks. I was at my friend Dara's house the other night and she had a cookbook lying completely flat on her counter. Though it was a recently published cookbook, the spine was broken and the open pages were wrinkled with use and the evidence of a few spills. I glanced at the brownie recipe before me and asked, "Make these a lot?" to which Dara smiled and said, "They're the best! I've made them so many times!" Like Dara's well-worn pages containing her beloved fudgey brownie recipe, I can pull out my favorite cookbooks and immediately find my favorite recipes by looking for the distinct wavy edges of pages that have met a spill or two. Or, better yet, when I lay a favorite cookbook down and the spine of the book seems to read my mind and opens to my comfort foods and favorite recipes. The tell-tale chocolate smudges and flour-dusted seams are like compasses in my journey as a baker--always reminding me of happy memories and desserts that work in the midst of baking fails and catastrophes. In fact, to this day, I can still go to my mom's copy of Better Homes and Gardens Cookbook and find the recipes for peanut butter cookies and spritz just by their tattered edges. Peanut butter cookies were the first cookies I learned to bake by myself. They reminded me of my grandma who always had a log of dough at the ready in her freezer and would slice off a piece for my sister and I before she put the rest in the oven to bake (now I know where I get that cookie dough Achilles' heel from...). We never made the dough at her house, so I never learned her recipe. Instead, I turned time and time again to a recipe in my mother's red cookbook for guidance and it never let me down! After I had memorized the cookie recipe, I decided to branch out to peanut butter squares. I stumbled upon a recipe from a magazine and decided to try it. Not only was it ridiculously simple, it also happened to be delicious. 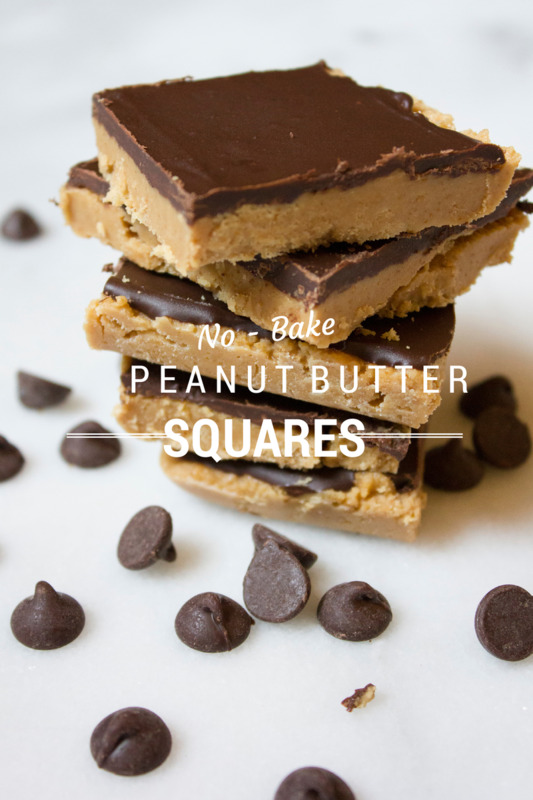 I made peanut butter squares countless times until I accidentally lost the recipe. Through trial and error, I eventually came up with something close to the original and used it until it was committed to memory. The measurements are easy enough and you can make them without ever turning on your stove, just so long as you have a microwave. They're a relatively quick recipe to bring to a party, too! When my blogging friend Colleen asked me what cookbook first made me realize I love to bake, my mind went blank! I had taken for granted growing up in a commercial kitchen, the food blogs I read, the classes I took and the books I had on my shelf. How could I pick just one? It wasn't until I saw the wrinkled pages of Dara's cookbook that my mind flashed to my mom's kitchen and all the happy memories I had baking peanut butter cookies with my sister. What cookbook made you fall in love with cooking or baking? Which pages are the most weathered in it? As part of Cookbooks & Calphalon, I'm joining 17 food bloggers are sharing stories and accompanying recipes to celebrate our love of cooking and the perfect pairing of Cookbooks & Calphalon! This wouldn't be complete without a fun giveaway for you to enter...so take a moment to enter our awesome Cookbooks & Calphalon Giveaway! Also, now through September 1st, Calphalon is celebrating couples! From the first meal they create together in their new home to the meal they share on their 25th anniversary, couple cook up memories! The cookware they choose serves as the foundation for which these “Couples Cooking” memories are made. Calphalon wants to recognize these #CouplesCooking moments by asking couples to share pictures of the meals they cook together for a chance to win $1,000 in Calphalon cookware! Calphalon is inviting couples to post photos of the meals they prepare with their significant other on Calphalon’s Facebook page. To enter, couples will be asked to share why the dish is unique or special to them and use the hashtag #CouplesCooking. How fun is THAT?? In a medium saucepan, melt butter over low heat. Add peanut butter and stir until melted. Turn off heat but leave the pan on the burner. Cream in the powdered sugar until well mixed. Add the graham cracker crumbs. The texture should resemble a thick, but pliable dough. Transfer dough to a 13x9" pan and spread out using fingers or a spatula into an even layer. Set aside. Melt chocolate chips over a double boiler. Spread melted chocolate evenly over the peanut butter mixture. Check out these delicious recipes and sweet stories too! Enter here to win! Good luck! Have you ever wondered where you could get quality spices for all of your cooking and baking needs? Tom & Patty Erd took over Patty’s parents business back in 1993 and have built The Spice House into what it is today...A resource for incredible spices and seasonings, as fresh as you can get them at an affordable price. They scour the world for the best ingredients and spices. From large farm collaboratives in exotic countries to boutique farmers who specialize in items not commercially produced, like one special connection they have with a friend’s mother who just so happens to own a vanilla plantation in Tahiti, where only a limited amount of beans are produced and they're very…very expensive. “We have a really great connection with that farm, and we'll get maybe 20 pounds of Tahitian vanilla beans month”. "That wouldn't work for huge spice company’s but it works well for us!" says Patty. There is a reason vanilla is the second most expensive spice in the world…did you know it can take up to 8 years to harvest a vanilla bean start to finish? To bring you the freshest ingredients possible The Spice House grinds and blends their spices and seasonings in small batches right in their stores which is why as you approach a store and walk through its doors you are greeted with an intoxicating aroma! Many of their spices come in pretty glass jars, however you can also order many varieties in bags (as well as in salt-free versions), and let me tell you...you will be blown away by their pricing! Their gift boxes are both gorgeous and well thought out. The thought they put into their gift box packaging is something you really don't see these days. They include whole nutmegs, cinnamon sticks and more as packaging you can actually use! Their delivery is always quick as well, which has always impressed me. Take a few minutes and peruse their offerings and prepare to be impressed! Once you try The Spice House…you just may fall in love with their quality, pricing and friendly service! I couldn't believe how quickly my spices arrived--not to mention the personal thank you on my invoice! Ultimately, I ordered lavender sugar, orange flower water, rose water, black truffle oil, Hungarian paprika, za'atar, agar and curing salt. I have no doubt there will be cured meats, Turkish delight and chicken paprikash in my future! But for now, I give you an easy summer cocktail and a chance to win BIG! Even if you win second place, you won't believe the amazing spices and flavorings you can get for $125! (Am I allowed to be jealous of the winners? Because I am!) Want more inspiration? Check out ALL The Spice House posts from my blogging pals to see what they made with their spices! 2 incredibly lucky readers will win a delicious prize!! Check out the rafflecopter below the recipe to enter for your chance to win! Be sure to check out ALL the posts below for your chance to win! Good luck! 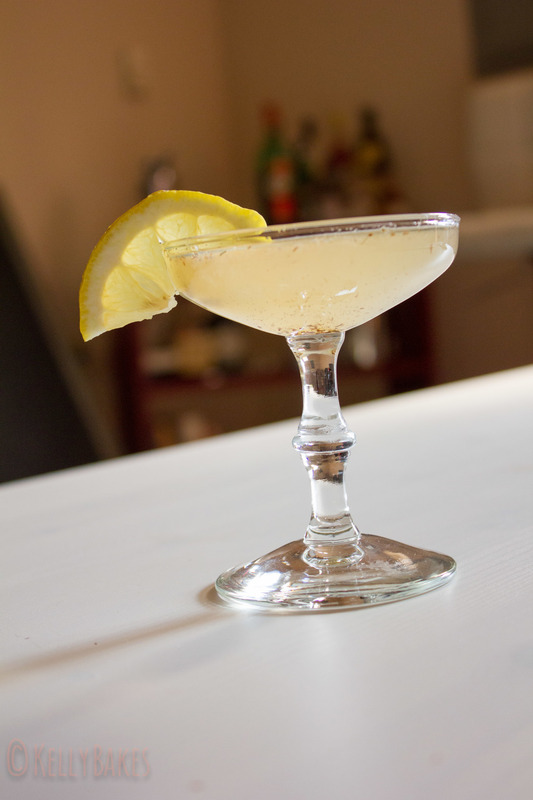 For my recipe, I made a delicious pear lavender lemon drop martini. It's like the classic lemon drop, only mildly floral and more complex. 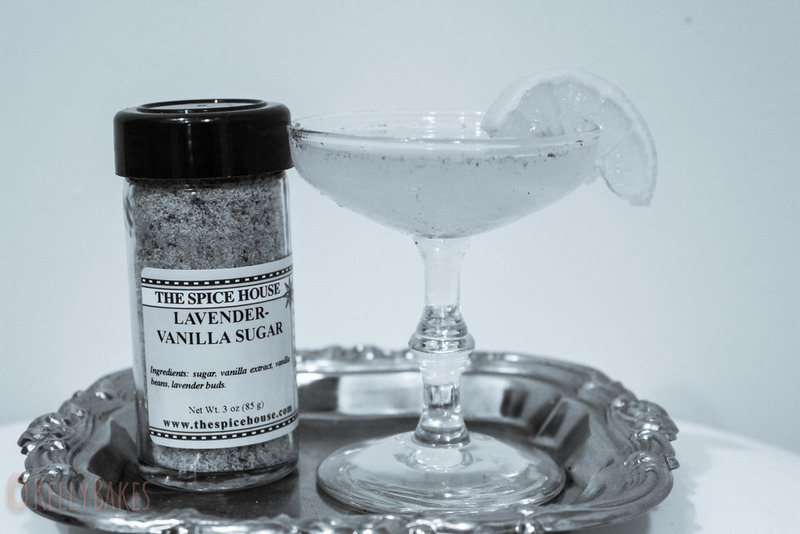 I find plain lemon drops to be a bit boring and too sweet, so the lavender sugar was a welcome addition to spice things up (no pun intended!). This recipe couldn't be simpler! 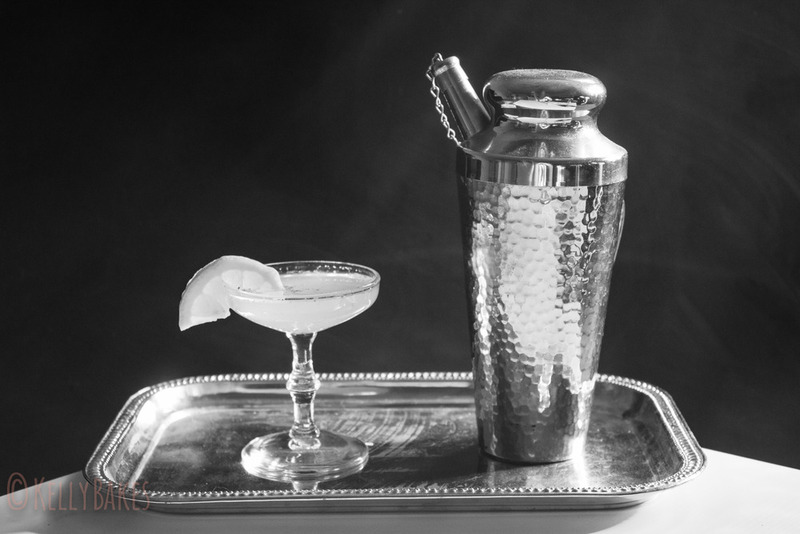 Combine all ingredients in a cocktail shaker filled with ice. Shake vigorously and pour into a coup or martini glass (the latter didn't follow me to my new apartment, so I used a coup glass). Enter below for your chance to win $250 in spices! Check out all the amazing recipes below! Lately, I've had traveling on the brain. It started when I was thumbing through my Instagram feed. In one week, I had five friends who were traipsing around Italy, posting photos of colorful heaps of gelato, delicious tangles of pasta and sunsets to make the poets sigh. Though I'm far from a poet, I sighed a little too. I was lucky enough to study abroad for a summer in Florence before my senior year of college and once I was back in the US, I made a travel bucket list of places I want to see. At the top of the list are a few places in Eastern Europe, a tour of the Greek isles, and France. I could lie and tell you that the latter is for the wine or the art, but if we're being honest, it's mostly just for the pastries. When I spent a summer in Galway, some of my favorite memories involved a sidewalk cafe, a coffee and a buttery fruit tart. I imagine a trip to France might just involve a lot of moments of me sitting at cafes, sampling French pastries, smiling a butter-induced smile and people watching. Sadly, there are no trips to France in my immediate future, so for now, I will settle for sitting outside with a homemade cafe au lait and one of these adorable madeleines. If you've never had them before, they're a cake-like cookie in a seashell shape. They're light and lovely and go perfect with afternoon tea or a mid-day coffee. I'm sharing these madeleines with some of my blogging pals to celebrate Bastille Day (no, not THAT Bastille). We've got a slew of French-inspired dishes to bring a little piece of France to your kitchen this July 14th! Be sure to check out all the posts. You can find all the links below the recipe for these lovely little Raspberry Lemon Madeleines! In a large bowl, combine the eggs and sugar. Whisk 5 minutes. The mixture should thicken considerably. Sift the flour, salt and baking powder over the egg mixture, all the while gently folding to incorporate the ingredients. Stir together the lemon juice and butter. Once the flour has been incorporated, slowly drizzle in the butter, folding into the batter as you pour. Refrigerate the batter for at least an hour and up to overnight. While the batter is chilling, spray the madeleine pans with non-stick spray (or lightly butter them). Dust with flour and tap off excess. Chill the prepared pans in the freezer until ready to add the batter. Bake in a 425F oven for 9-11 minutes or until the cookies feel just set. Remove from the oven and transfer to a cooling rack immediately. (optional) Drizzle with a lemon glaze (confectioner's sugar + lemon juice) while warm or dust with confectioner's sugar once cooled. ...either way, serve with a cafe au lait or tea and enjoy! Still hungry? Check out all the Bastille Day recipes below!